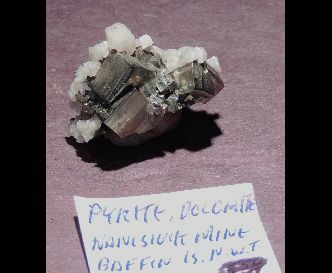 Group of uniquely twinned Nanisivik mkine, arctic Canada specimen of Pyrites and Dolomite. Both species are well crystallized and nice specimens like this are not easily accessable. Largest Pyrite is .8 cm. These were collected buried in layers of ice and only after careful thawing, could the specimen be appreciated.